PENSIONERS and other holders of the free bus pass can now use an Inishowen bus company after a landmark campaign by the company and an MEP. 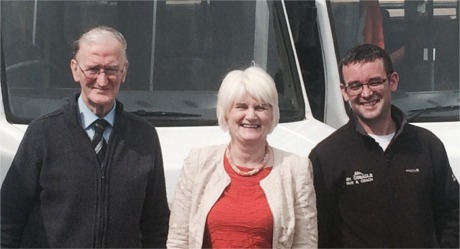 Independent MEP Marian Harkin recently met with the owners of McGonagle Bus Company including Hugh McGonagle and son Philip after a positive decision in Europe. Independent MEP Marian Harkin pictured at McGonagle Bus Company's depot in Buncrana with Hugh McGonagle, left, and son Philip after she secured a positive ruling on free bus passes. She had been approached by private bus service providers who were being prevented from accepting free pass holders on their buses. “I took the matter up at European Commission level under anti-competitive regulations and within ten months had secured a positive result for the private bus operators," said Ms Harkin. "This was an example of where, once again, Irish authorities had not acted in accordance with EU law and it emphasised the right of citizens to pursue redress when they feel that as private citizens or as companies, that the state is not acting properly," she added. Hugh McGonagle thanked Ms Harkin for her work in securing the right of private bus operators to carry free bus pass holders while his son Philip urged her to "continue focus on the rural transport needs necessary to help to maintain the social and economic fabric of rural areas".